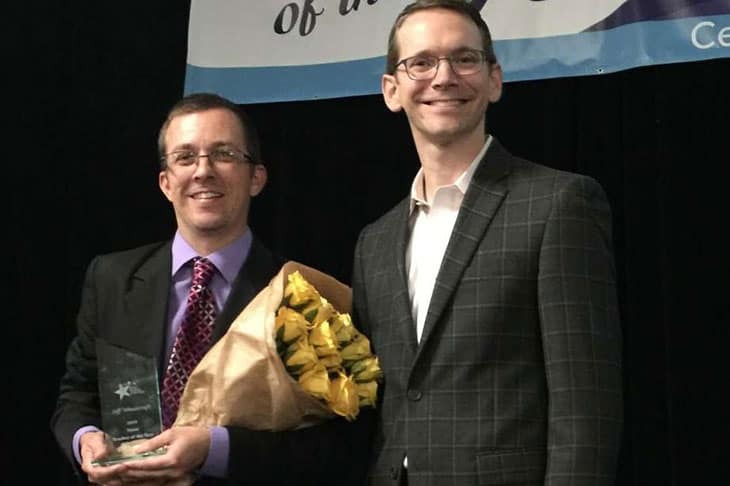 HOUSTON (October 10, 2018) – The Texas Association of School Administrators (TASA) has announced that Jeff Wheatcraft is the Texas Teacher of the Year and the Texas Secondary Teacher of the Year. Wheatcraft is a middle school Science, Technology, Engineering, and Math (STEM) teacher at Alamo Heights Junior School in San Antonio. Wheatcraft came into teaching by completing the Texas Teachers alternative certification program (ACP) in 2006 earning his Art teacher certification. At the same time, he earned his science teacher certificate through Texas Teachers and transitioned into science during his second year of teaching. There are more than 350,000 teachers in Texas and Jeff was selected through a lengthy process as the best teacher in the state. A panel of judges composed of representatives of Texas teacher associations and last year’s Texas Teacher of the Year finalists select the finalists from the 40 Texas Regional Teachers of the Year — one elementary and one secondary teacher from each of the 20 Texas Education Service Center regions. TASA then selects the Texas Teacher of the Year. In the past, Wheatcraft has been nominated twice for the Presidential Awards for Excellence in Mathematics and Science Teaching (PAEMST). He will now compete with educators from across the country to be the National Teacher of the Year as selected by the Council of Chief State School Officers. Wheatcraft will participate in one-of-a-kind professional learning opportunities designed to hone communications skills, expand knowledge of education policy, and grow teaching and learning practices. The goal of this programming is to elevate the voices of teachers and ensure that teachers are leaders in state and national policy conversations. The National Teacher of the Year (NTOY) is chosen from the State Teachers of the Year by a national selection committee representing the major national education organizations. This spring, the National Teacher of the Year will be introduced to the American people by the U.S. President. Wheatcraft was working as a swing dance instructor, but he and his wife knew he needed a career path better suited for a new family. His wife realized that with such a passion for teaching and watching people learn as an instructor that he would be great in the classroom. They saw a billboard from Texas Teachers and they wrote down the number and called that day. He joined the program that month and he started teaching that fall. Wheatcraft will have a very busy schedule for the next year as the Texas Teacher of the Year but will also make sure his students continue to make progress in middle school. For additional details about Jeff Wheatcraft -please visit Texas Teachers! A+ Texas Teachers / Teachers of Tomorrow is the largest, fastest growing Teacher Certification Program in the nation, delivering online training to individuals who want to pursue a career in teaching. Teachers of Tomorrow attracts career changers with an average age of 32 into teaching so they can bring their real-world experiences into the classroom. Teachers of Tomorrow is the second most diverse certification program in the country with 46% non-white enrollment. In Addition, 70% of Teachers of Tomorrow teachers remain in the profession after five years, significantly higher than the national average of only 50%. Over the last 11 years, Teachers of Tomorrow has certified more than 50,000 new teachers, and in 2017 the Company trained and certified more than 6,000 teachers. An independent study revealed that Teachers of Tomorrow graduates see student achievement results equal to teachers coming through university programs. Teachers of Tomorrow is an approved teacher certification provider in Texas, Florida, Nevada, Indiana, South Carolina, Michigan, Arizona and North Carolina.